Irresistible Grain Free Chocolate Chip Cookie Dough Balls. 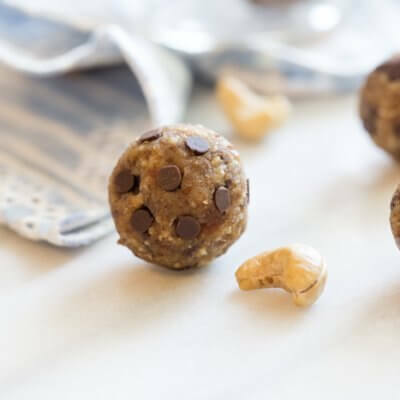 These chocolate chip cookie dough balls are made with a few whole food ingredients– cashews, dates, and flaxseed + chocolate, duh. Grain free, egg free, dairy free– that’s no butter ya’ll. In small bowl, soak dates and cashews in almond milk for at least an hour. In bowl of food processor, pour soaked dates, cashews, and any remaining almond milk; process until dates and cashews are minced. Add flaxseed, salt, and vanilla extract and pulse until blended. Remove blade and stir in coconut flour until mixed and then mix in chocolate chips. Place parchment paper on clean surface. Coat hands in coconut oil or cooking spray and form dough into 32 small bite sized balls. Store balls in airtight container in fridge.